Within the past six months, Rush has become the paramount new group to emerge in Canada. Its last single, "Fly By Night," was Top 10 in the north country and the album of the name has been charted over six months and is still Top 30. The group's first two albums have sold a combined total of 80,000 in Canada, equivalent to 800,000 U.S. sales. But the states have not been far behind. In fact, they were the first to recognize Rush's talents. Since the release of the group's debut album, "Rush," in August of last year, the band has spent much of its time touring the U.S. extensively. Rush is Geddy Lee, bass guitar and lead vocals; Alex Lifeson, guitar; and Neil Peart, drums; all contribute their songwriting talents. Geddy and Alex formed the group six years ago in Toronto with another drummer. The three did the obligatory gigs in high schools in the area for a couple of years, turning pro after high school graduation. The band moved on to clubs and bars for two gruelling years, building a loyal following. Early in 1973, the group decided it was time to record an album. Following a gig that ended at midnight, Rush trudged to Eastern Sound in Toronto and eight hours later most of an LP was done. But the band felt the sound and some of the performances weren't quite right, so a few months later the group went to Toronto Sound to re-record and remix the songs. Three days later, the album was done. Rather than shop around for a label, the band and its managers, Ray Danniels and Vic Wilson, set up Moon Records and released the LP themselves in early 1974. A couple of months later, WMMS-FM in Cleveland got a copy of the album, played it, and the phones went wild. Record stores in the city starting selling the Canadian pressing. 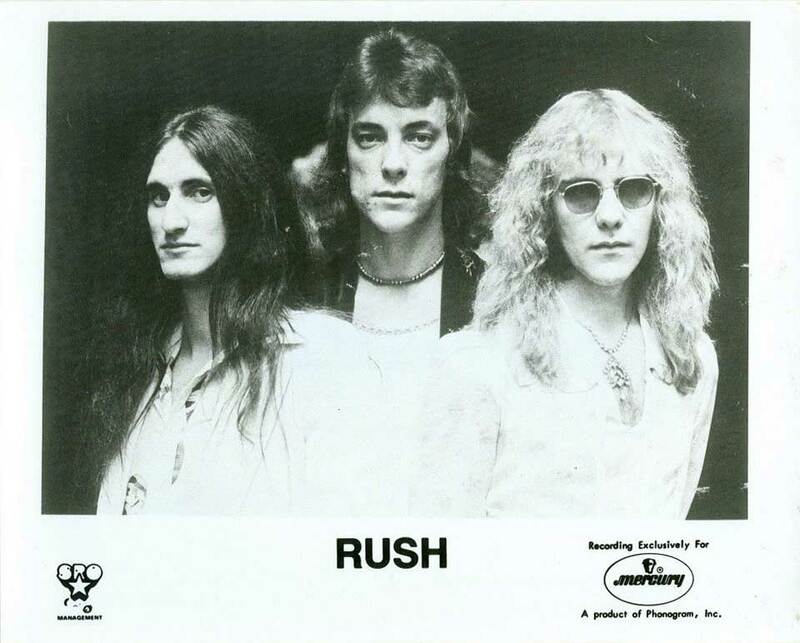 The trio's management went to American Talent International (one of the U.S. 's largest booking agencies) which signed Rush on the spot and sent a copy of the LP to Mercury Records. Twenty-four hours later, Rush was signed to Mercury and the LP was released in August. Mercury's distributor in Canada, Polydor, Ltd., assumed Canadian distripution. At this point Neil Peart joined the band as drummer just six days before a four month U.S. tour. He immediately fit in and audiences in St. Louis, Detroit, Cleveland, Chicago and other cities soon saw the power of Rush. In January of this year, the group recorded "Fly By Night," which solidfied the U.S. market but broke them wide open in Canada, enabling Rush to win a Juno Award (the Canadian Grammy) as Most Promising New Group of 1974. Following a four month U.S. tour (with Aerosmith and Kiss) the band returned to Canada for its first headlining tour. It climaxed on June 25 at Toronto's Massey's Hall. The show was a sellout, with hundreds turned away. In mid-July, the group returned to the recording studio to cut "Caress Of Steel," the new album. It is stamped with Rush's signature: hard rock in its finest form, and a quality of lyrics not seen in most music of this genre. Most of the lyrics on "Caress Of Steel" were written by Neil. Within the past year, Canadian rock bands have been making their marks in America. Rush is no exception, they're just better at it.